Boston Loves Paris: Red Sox Win! 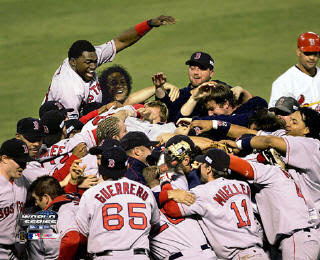 The Red Sox won the World Series for the second time since 2004!! Before that, the last time they won the World Series was 1918! They called it "The Curse of the Bambino." Babe Ruth was a great player for the Red Sox. The Red Sox gave him to the NY Yankees. Babe told the Red Sox, "You'll never win without me." And the Red Sox didn't win. For a very, very long time. 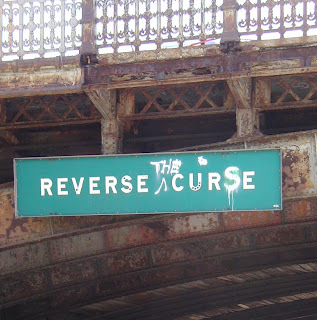 This is a street sign that used to read "Reverse Curve". It was changed to "Reverse the Curse", to try and get rid of the Curse of the Bambino! We take our baseball seriously here in Boston! That's right, the Red Sox took over the Duck Boats, and took the Red Sox all over the city, including right in front of our home! (Well, right on Cambridge Street.) Angela was at the hospital all day, her brother Andrew was visiting. They had a great view of the Salt & Pepper Shaker bridge, and she knew the Ducks would eventually end up there. Guillaume was at home, watching The Rolling Rally on TV, waiting for them to get to the end of Cambridge Street, so he could run down to take pictures. We thought they would stop at City Hall Plaza and get off the Ducks, but they didn't. So all of a sudden, half of the Ducks were outside the hospital window! Angela called Guillaume and said, "Run! Run to the street or you'll miss them!" Andrew ran too. He got downstairs in time to see the Ducks roll by. He didn't have a camera, though. This is Cambridge Street with a lot of fans. Whole Foods, and the Holiday Inn are on the left, our apartment is to the right (not in the picture). There were lots of police protecting us! Here come the Red Sox! Here's Manny Ramirez! Big Papi (David Ortiz) was on this Duck too, but he was on the other side, so Guillaume couldn't take a picture. The two older guys are David and Eliot. They own a huge chain of furniture stores. At the beginning of the season, they said if anyone bought furniture on a certain weekend in July, and the Red Sox won the World Series, they would get some of that furniture for FREE! Coco Crisp on the left and Jacoby Ellsbury, in front of the Holiday Inn! 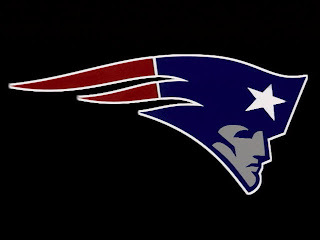 In other sports news, the New England Patriots (American) football team are undefeated after 7 games, so we're looking forward to a Superbowl Showdown! And of course, the Boston Bruins (ice hockey) going for the Stanley Cup! We are so happy for Boston !!! What a big crowd just close to your house ! hi children and co..this is claudia on line; alias ptit' mam'..
coucou...j'ai tenté d'ouvrir un compte blogger au nom de ptit'mam' mais ça a foiré..bisous quand même..
figure toi que j'ai pas reussi moi non plus a creer un compte avec mon adresse.... zarbi !! donc on fonctionne avec l'adresse de nico .